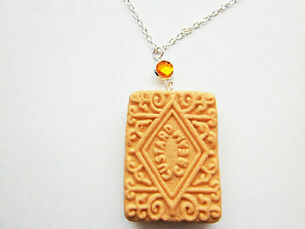 Sculpted from fimo and handcrafted to look like a realistic replica of the famous Custard Cream biscuit, this pendant hangs from a silver plated 18in chain. Unique man-made gemstone in Topaz colour. * Not suitable for young children and not edible.